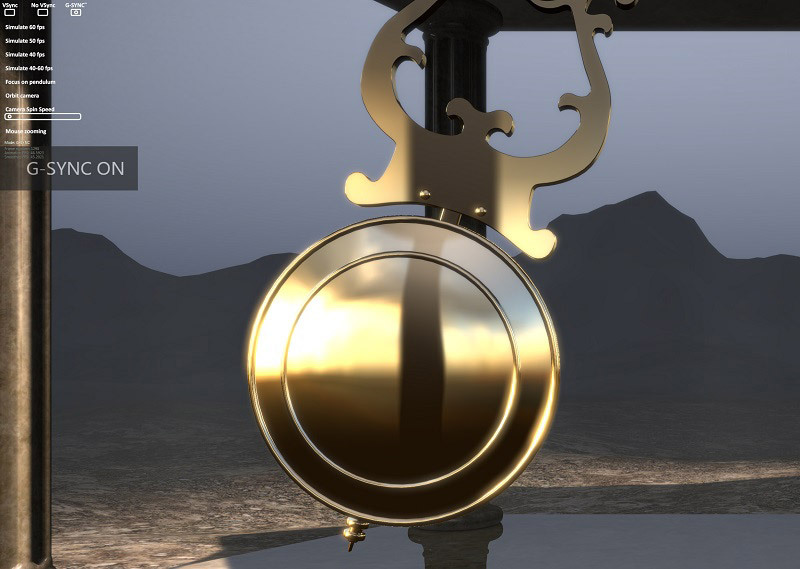 For testing, we first take the nVidia own G-Sync pendulum demo (Link). If we have done everything right up to this point, the “G-SYNC ON” overlay will be displayed at the start (and also for every other 3D application) in the middle left corner. 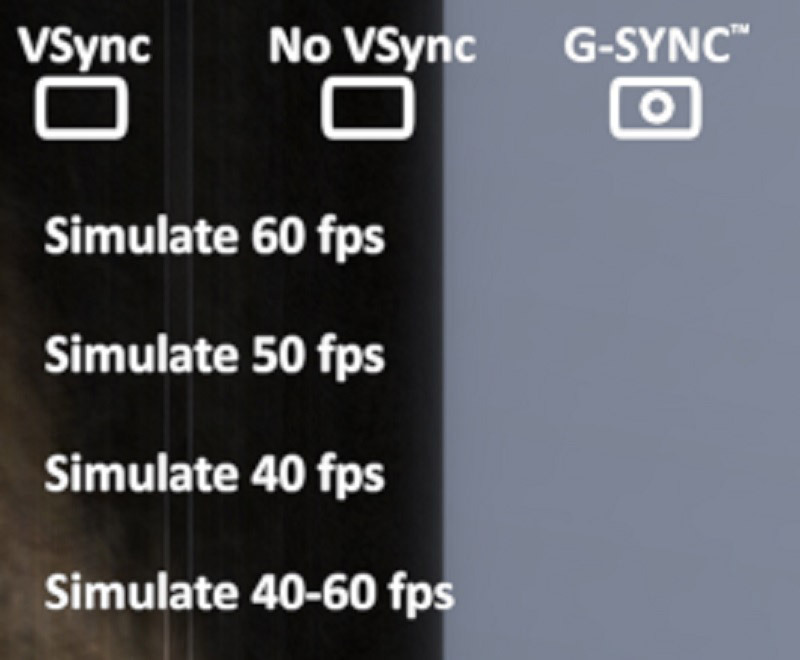 In the running demo we can now toggle between V-Sync, no V-Sync and G-Sync in the upper left corner and also set the output fps to test if G-Sync works as desired. Ideally, G-Sync should provide the most fluid representation without the image “tearing”. Shortly to the theory: with V-Sync, the video refresh rate (fps) of the graphics card is coupled to the maximum refresh rate of the monitor, with our 60 Hz monitor, for example to 60 fps. As long as the PC manages to maintain the 60 fps, we can expect a smooth, trouble-free image. In addition, the frame time is approximately 16.6 ms (1 second = 1000 ms | 1000 ms: 60 fps = 16.6666 …), i.e. between each displayed image pass 16,6,6ms. This value, the bigger it gets, becomes noticeable as an input lag. If the fps falls below 60 fps, the output will be reduced to 30 fps, and each image will be displayed twice to get back to 60 Hz. The frametimes doubled to 33.33ms. With no V-sync as many fps are output as the PC creates and if necessary only partial pictures updated, the fps should not coincide with the refresh rate of the monitor. With this setting, the frametimes decrease, but the image “tearing” occurs, i. one half still displays the last image, while the other already indicates the next, etc. This setting should always be avoided and was certainly also a stumbling block in the development of monitors with variable refresh rates. With G-Sync or FreeSync, the output fps and the refresh rate of the monitor are synchronized with each other. To take our LG monitor again as an example, at e.g. 42 fps the refresh rate of the monitor 42 Hz, 56 fps 56 Hz, etc. In theory, so within the FreeSync Range always a clean smooth image to expect. Disillusionment spread in practice, because the pendulum stuttered or tore despite G-Sync, no matter how many fps we set. Only when we changed the FreeSync mode from “Extended” to “Basic” in the monitor menu, the pendulum became fluid, but only as long as the fps were set between 48 and 59 fps. If the fps were above or below, the pendulum started to jitter again or showed tearing, as before. Here we meet another hurdle that should be considered: Monitors with 60 Hz display have a very low FreeSync range (usually 40-60 Hz), whereas nVidia requires a ratio of 2.4: 1 and for a good reason: If the fps fall below the FreeSync range, you could again achieve a refresh rate that is within the FreeSync range at a ratio of 2.4: 1 by double displaying each frame. This is called LFC (low framerate compensation). In another test with real games, the same result as before with the nVidia pendulum demo showed in our LG Monitor: With activated G-Sync you get the best result within the range of 48 to 59 fps.